Desmoid tumors are fibroblastic/myofibroblastic neoplasms, which originate from musculo-aponeurotic structures and are classified as deep fibromatoses. Despite their benign histologic appearance and lack of metastatic potential, desmoid tumors may cause aggressive local infiltrations and compression of surrounding structures. They are often associated with female gender, familial adenomatous polyposis (FAP) and sporadically may occur at sites of previous trauma, scars or irradiation. Molecular studies have demonstrated that these patients are associated with a bi-allelic APC mutation in the affected tissue. Radical tumor resection with free margins remains the first therapy of choice. In cases with anatomical or technical limitations for a wide excision, radiation therapy represents a proven and effective alternative or supplementary treatment. Desmoid tumors (fibromatosis) are histologically benign fibroblastic/myofibroblastic neoplasms, which originate from musculo-aponeurotic structures and are classified as deep fibromatoses. Desmoid tumors may arise at any site, however, the extremities, the abdomen and the retroperitoneum are the most common sites of origin. In contrast, fibromatosis of the chest wall are much less frequent. Despite their benign histologic appearance and lack of metastatic potential, desmoid tumors may cause aggressive local infiltrations and compression of surrounding structures. A high recurrence rate exists and in anatomic locations with restricted access to surgical resections, desmoid tumors can even lead to death [1, 2]. Desmoid tumors are often associated with female gender, familial adenomatous polyposis (FAP) and sporadically may occur at sites of previous trauma, scars or irradiation [3–6]. Even though desmoid tumors account for only 0.03% of all neoplasms, in patients with FAP, the estimated prevalence rises to approximately 13% [6, 7]. Histological examinations demonstrate long fascicles of spindle cells of variable cell-density with few mitoses and the absence of atypical nucleus-separations. Characteristically, there is a diffuse cell infiltration of adjacent tissue structures. Immunohistochemically, the spindle cells are positive for vimentin, smooth muscle actin and muscle-specific actin, reflecting a fibroblastic/myofibroblastic differentiation. Recent findings revealed that virtually all deep fibromatoses exhibit somatic mutations of either the beta-catenin or adenomatous polyposis coli (APC) gene. Consequently, all of these tumors are immunohistochemically characterised by diffuse nuclear beta-catenin staining [6, 21]. Notably, molecular studies have demonstrated that desmoid tumors in autosomal inherited FAP disease show clonal neoplasms arising from germline mutations or changes in the APC gene . These are associated with a bi-allelic APC mutation in the affected tissue [2, 8]. In individuals lacking germline mutations the development of desmoid tumors requires a rare combination of events, such as at least two somatic mutations in both alleles of a single tumor suppressor gene, in this case the APC gene. Correspondingly, FAP patients, exhibiting a germline mutation of the APC gene require only a single additional somatic mutation of the second allele of the APC gene for desmoid tumor development . To date, radical tumor resection with free margins remains the first therapy of choice. Depending on the tumor localisation, surgery might sometimes cause major soft tissue defects. Although abdominal wall integrity can be restored with direct sutures, reconstruction using synthetic materials is a common technique in major abdominal and/or thoracic wall defects. Greater wall defects not suitable for reconstruction by local flaps can be covered by free muscle flaps. Even though radical surgical approaches are usually favoured, radiation therapy is a suitable alternative therapeutic option. A substantial amount of evidence exists supporting the efficacy of radiation therapy for the treatment of desmoid tumors [12–16]. Radiation therapy may be used alone or in combination with surgery, either preoperatively or postoperatively. Other alternative therapeutic options like anti-inflammatory treatments, hormone therapy and chemotherapy have not been proven to provide any therapeutic effectiveness. Therefore these therapies are limited to patients, in whom resection is technically unfeasible, e.g. due to widespread tumor infiltration. Due to the germline mutations of the APC alleles, pre-clinical studies of gene transfer for the treatment of desmoid disease in FAP have been performed . However, further studies are needed to assess the clinical effects of trans gene expression therapy. The chest wall is the most common extraabdominal site for desmoid tumors . 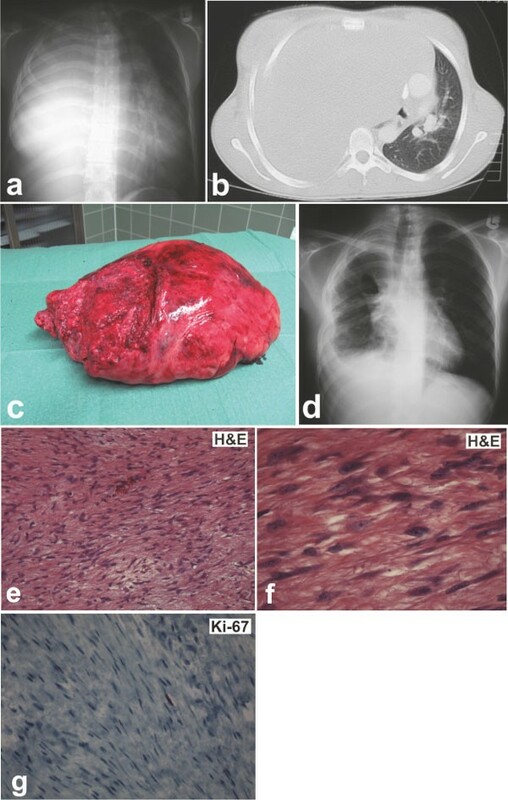 However, true intrathoracic desmoid tumors are extremely rare with most cases representing intrathoracic extension of chest wall tumors, like the case presented below. A 17-year-old woman from Kosovo visiting her relatives in Germany was admitted to our hospital with chronic respiratory insufficency. She reported about a "tumor" in her right hemithorax which had been treated previously with "alternative medicine" for the last 5 years. The CT-scan of the chest revealed complete compression of her right lung by the tumor-mass and a consecutive dislocation of the mediastinum (panel 1a, b). Histopathological evaluation of biopsies revealed a fibromatosis (panel 1e, f, g). Panel a and b: Conventional X ray and CT-scan showing complete compression of the right lung by the tumor-mass and consecutive dislocation of the mediastinum to the left. Panel c: Desmoid tumor of the right hemithorax (3580 g) is macroscopically composed of a well-defined capsule infiltrated by a collagen network with fibrotic sections. Panel d: Postoperative X ray: the right lung is compressed and poorly ventilated. Panel e and f: Histological characteristics; Elongated, slender, spindle-shaped tumor cells with small pale-staining nuclei and poorly defined boundaries are embedded in abundant collagen. Panel g: Low proliferation activity as evidenced by immunohistochemical detection of nuclear Ki-67 expression. Intraoperatively, it became apparant that the mass had originated from the intercostal muscle of the right upper thorax and filled up the complete hemithorax. Nevertheless, it was technically feasible to completely remove the tumor including a resection of two ribs (panel 1c, d). Consecutively, the small poorly developed right lung was mobilised and the thoracic wall defect was reconstructed using synthetic materials (polypropylene net) in a common technique. The postoperative follow up was uneventful and the patient was discharged home on the 14th postoperative day. Histological examination of the resected specimen revealed a tumor which consisted of elongated, slender, spindle-shaped cells of uniform appearance. These cells were embedded in abundant collagen with little or no cell-to-cell contact. Cellular boundaries were poorly defined. Nuclei were small, pale-staining and sharply defined with only minute nucleoli (panel 1f). The immunohistochemistry revealed a minority of spindle shaped tumor cells, expressing the proliferative Ki 67 antigen (panel 1g). Based on these characteristics the diagnosis of an extra-abdominal fibromatosis (desmoid tumor) was made. Desmoid tumors involving the chest and adjacent structures are locally aggressive tumors with a high recurrence rate. In the literature, recurrences are strongly associated with positive margins, which underlines the need for wide radical resection of margins whenever possible . Desmoid tumors have a remarkable tendency to infiltrate into surrounding structures . For this reason, wide radical resection has been considered essential for successful management . However, obtaining a negative margin involving the chest region often represents a therapeutic challenge for the surgeon. Unlike superficial chest wall desmoid tumors which will create a palpable mass, intrathoracic tumors will not cause symptoms until they grow large enough to locally invade surrounding structures or compress pulmonary parenchyma, like the case presented herein. Thus, wide local excision is often impossible because of surrounding vascular and neural structures. Therefore, it may be advisable to consider radiation therapy as an alternative or concomitant treatment for desmoid tumors. The efficacy of radiation therapy for the treatment of desmoid tumors is supported by substantial amount of evidence [10, 12–16]. For patients with positive margins or residual disease after surgery, adjuvant radiation therapy in combination with surgery results in equivalent local control to surgery with negative margins. Thus, for patients who are not surgical candidates or who refuse surgery, radiation therapy alone results in durable local control rates of 70 to 80% [10, 12–16]. Disease regression may take some time after radiation therapy, however, long-term local control rates are excellent. Normal tissue toxicity and potential late radiation effects, including secondary malignancies, are important considerations in the treatment of otherwise healthy, often young patients. However, the typical radiation dose necessary for the treatment (50 Gy) does not exceed bowel tolerance and is associated with a low risk of complications . Furthermore, the use of modern, conformal radiation treatment planning techniques allows for a minimization of normal tissue dose. When considering disease progression that could result in significant morbidity and mortality, the potential benefits of radiation therapy clearly outweigh the risks. In conclusion, primary radical resection with negative margins remains the principal determinant of outcome for intrathoracic or chest wall desmoid tumors. Positive margins after surgery reflect a high risk for local recurrence. Thus, in cases with anatomical or technical limitations for a wide excision, it may be advisable to consider radiation therapy as an alternative or concomitant treatment. Radiation therapy represents a proven and effective therapy for this disorder. E Bölke, H Krasniqi contributed equally to this work.